It has been reported that Everton will look to make Leighton Baines the clubs top earner after he decided to remain this summer. The 28 year old England left-back opted against a move to Manchester United and the Toffees want to reward him for his loyalty by offering a new deal. 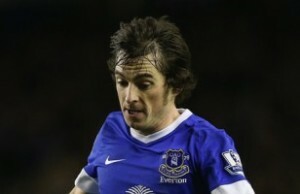 It is believed that Everton are prepared to pay Baines £75,000-a-week and will open talks soon now that the transfer window is closed. Manager Roberto Martinez said: “From having interest to a situation where you have to consider a move is very, very different. “Leighton is a very special footballer and a special player for Everton. We are looking forward to him enjoying the challenge that lies ahead.